My love of turquoise and pearls continues with these Glowing Sky earrings. This makes 100 active listings for me on etsy right now. YAY!! I've fallen a bit short on my goal this week of listing a new item a day. I'm hoping to get back and stay on that path though. Just loverly...congrats on 100 listings, that's quite an accomplishment! I have always loved turquoise but unfortunately, it seems it has fallen out of vogue lately and surfaces in Indian wear. That is why I was delighted for your latest find...they are beautiful! Beki, country music came on when I went to leave a comment. That's a new one! Love the earrings. I collect vintage southwestern turquoise jewelry, Beki. I'm always glad to see something along these lines. Unusual choice to combine with pearls. It works very nicely. 100 listings. I am SOOOO impressed. You go! I was just in a country music kind of mood and this song cracks me up. 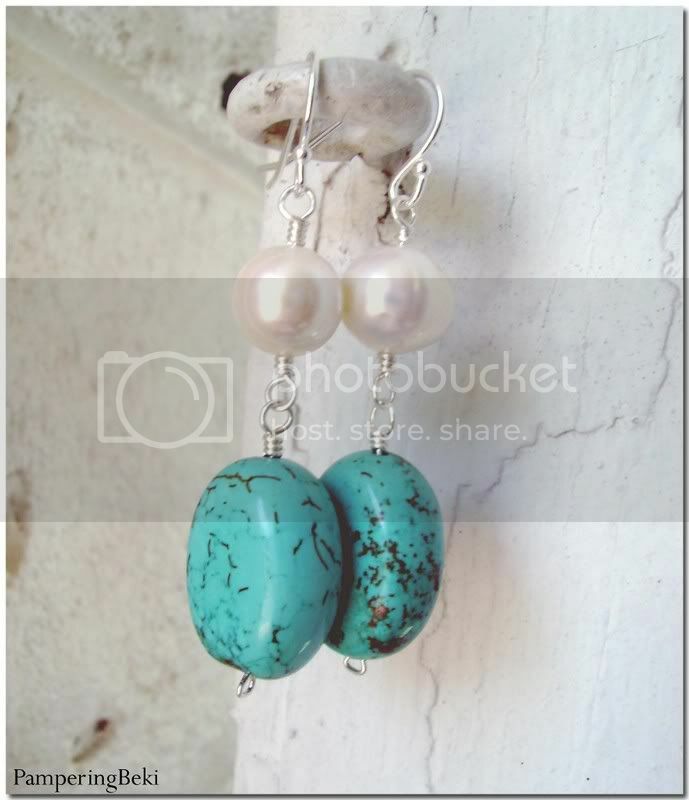 You know I would have never thought to put pearls and turquoise together. What a nice mix of classic and down home.